In just a few days it will be December, and many of us will begin to think seriously about the business of getting ready for Christmas and Hanukkah. Homes need to be decorated, cakes and other treats need to be baked, parcels need to be packed up and mailed. And, of course, presents need to be bought. I am a firm believer that books make wonderful gifts - big surprise! If you are looking for some good books to give the child or children in your life take a look at the Special Feature that I put together for the November/December issue of TTLG. Here you will find great gift ideas for children of all ages. There is Rita and Whatsit and Pingo, Panorama and A birthday for Bear. For older readers there is a A season of gifts and Thirteenth Child. If you don't know what kind of book to get, consider getting the child or children a gift certificate from your local bookshop. Getting a gift certificate for my favorite bookshop here in Ashland is always a great treat, and I always make an outing of it. Congratulations to my three winners who won the Winter's Tail giveaway and the Christmas book giveaway. Many thanks to Scholastic for offering TTLG these great prizes. I grew up on the Island of Cyprus, where they do not traditionally celebrate Thanksgiving. However, because my mother is American, we used to celebrate the holiday every year when I was growing up, often inviting over other Americans to share the day with us. Cranberries were not easy to find, and a few times we had to have pheasant because turkey was not available, but I always enjoyed our family Thanksgiving. One thing I never did during those years was to think much about the history of the holiday. It was only after I moved to the United States that I began to read stories about the first Thanksgiving. I know it is a little late - Thanksgiving being only a few days away - but you may still have time to go to a bookshop to get a Thanksgiving themed book for the child or children in your life. Perhaps you are taking tomorrow off and would like to share the day buying and reading books. If so, then do take a look at the Through the Looking Glass Thanksgiving feature. In this collection of books there are several titles that really capture the true spirit of what the first Thanksgiving might have been like. Myths are debunked, and readers will discover that the true story is even more meaningful than the stories they might have grown up with. Of course there are also some silly, funny, and entertaining titles as well. 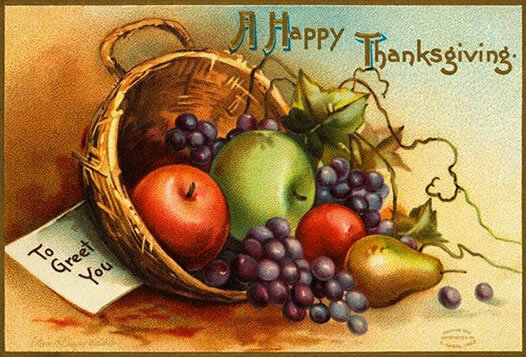 Whatever you do over the next few days, I hope you have a wonderful Thanksgiving. The Scholastic Christmas book giveaway (see below) ends on Friday November 27th. Don't forget to send me an email so that you can be included. These are wonderful books and I am sure you and your child or children will greatly enjoy reading them this holiday season. This week the 2009 National Book Award Finalist for Children's Literature was announced. The title is Claudette Colvin: Twice Towards Justice. The book was written by Phillip Hoose and published by Farrar, Straus, and Giroux. This book reveals the true story of Ms. Colvin, who, as a fifteen-year old in 1955 Montgomery, Alabama, refused to give up her seat on a segregated bus to a white woman, nine months before Rosa Parks took a similar stand. Ms. Colvin then went on to challenge segregation a second time, as a key plaintiff in the landmark case ofBrowder v. Gayle, which struck down the bus segregation laws in Montgomery. Rebellion was on my mind that day. All during February we’d been talking about people who had taken stands. We had been studying the Constitution in Miss Nesbitt’s class. I knew I had rights. I had paid my fare the same as white passengers. I knew the rule—that you didn’t have to get up for a white person if there were no were no empty seats left on the bus—and there weren’t. But it wasn’t about that. I was thinking, Why should I have to get up just because a driver tells me to, or just because I’m black? Right then, I decided I wasn’t gonna take it anymore. I hadn’t planned it out, but my decision was built on a lifetime of nasty experiences. The white woman kept standing over my seat. The driver shouted, “Gimme that seat!” then “Get up, gal!” I stayed in my seat, and I didn’t say a word. In Anna Rosen's The Merchant of Noises, an industrious entrepreneur sells ingenious devices that make wonderful sounds; in Ned Kelly and the City of the Bees, a sick boy is swept away on a magical (and educational) journey through the buzzing hive; in All Around the Block, Judy Plume's visual puzzles will entertain child and parent alike; in Catherine Certitude, a little girl and her father share a special bond, as well as a secret. No gift is more rewarding than a good book: as a companion, as a playmate, and as life-long inspiration. Godine is pleased to offer these four fine titles together for only $30.00, now until December 20. Happy holidays! List Price $65.80 · Special Offer $30.00 · a $35.80 Discount! Every Christmas Eve, Marie and Fritz Stahlbaum get a special treat, their Godfather Dosselmeier gives them wonderful toys that he has made for them. This year Godfather gives the children a beautiful dollhouse and a wooden soldier nutcracker. Often reckless and in a hurry, Fritz breaks the nutcracker by accident. Compassionate Marie takes pity on the broken soldier and she cares for him tenderly. The evening Marie stays up a little later than everyone else, and to her amazement some incredible things start to happen. The room fills with mice and then a huge Mouse King arrives. The Mouse King leads his mice soldiers in an attack, which is then repulsed by the Nutcracker and his toy allies. Toy soldiers, dolls, puppets, and animals join the battle, and then…Marie wakes up. The next morning Marie wakes up and she is in bed. She has a cut on her elbow and she has to stay in bed. One evening, Godfather Dosselmeier comes to visit Marie and he tells her the sad story of the Nutcracker. Many children are familiar with the Nutcracker story in some form. In this book, Wren Maysen presents her readers with a wonderful adaptation of E.T.A. 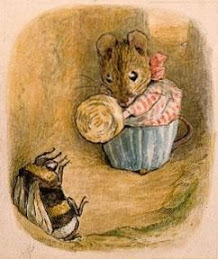 Hoffman’s original tale. 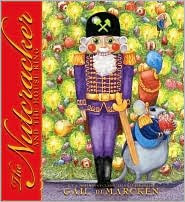 This version of the Nutcracker is more involved than the one used in the Nutcracker ballet, and Gail de Marcken’s rich and detailed illustrations beautifully compliment the magic filled story. Far to the north of here, there is a little house with a red door. This is where Santa Claus lives. Now that the days are getting shorter, Santa gets that special feeling that tells him that the magic will soon be arriving. He has a lot to do to get ready. Santa calls the reindeer in and he feeds them well. He polishes the sleigh and oils his boots. Santa looks in his big book and decides what each child should get for Christmas. And, of course, Santa waits for the magic. This beautiful picture book perfectly captures that special Christmas magic that we all eagerly wait for. As we read, anticipation builds up until that special moment in the story when everything is ready. 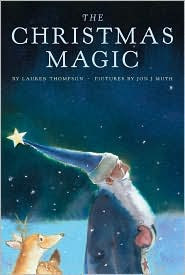 Jon J. Muth’s illustrations beautifully compliment Lauren Thompson’s lyrical text. Together they give young readers that perfect taste of the Christmas magic that is on its way. Scholastic is offering two lucky readers a copy of The Nutcracker and the Mouse King, and two more a copy of The Christmas Magic. Please drop me a line to be entered in this giveaway. On November 18th, judges will be choosing the winner of the Young People's Literature National Book Award for 2009. Here are the finalists for the award and interviews with the authors. This information was provided by the National Book Foundation. On this day in 1606 a group of Englishmen, including an explosives expert called Guy Fawkes, tried to blow up the Houses of Parliament in London. This "Gunpower Plot" failed, and the conspirators were tried and later executed. I understand that there is more to the poem than this, but we children never knew the words. There is lots of information about Guy Fawkes and the Gunpower Plot on Wikipedia if you are interested. I am still on the lookout for a good book for children about this event in history. If anyone knows of one please let me know. Happy November everyone. The new issue of Through the Looking Glass is now online. At the moment I am working on building a new site for TTLG, so I am doing bimonthly issues to give myself time to learn the new system, and to enter the many thousands of old reviews into the site. Therefore, the new issue is for November and December, and in it you will find lots of gift suggestions for the holidays. There are wonderful picture books, some delightful works of fiction, and some great novelty titles. There are also audiobooks and nonfiction titles. I hope you enjoy the new issue and I really look forward to being able to bring you the new and improved website in a few month's time.